Nothing is too big to tackle with a little bit of help. 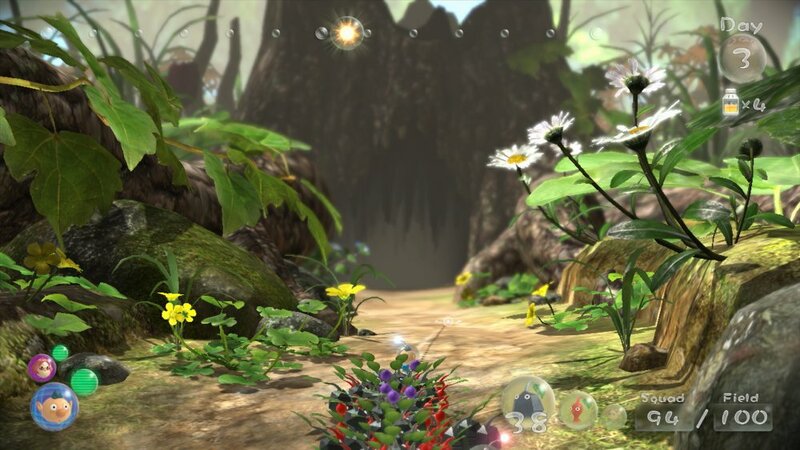 As a game series that began almost 12 year ago and with a massive fanbase to appease, Pikmin 3 had a lot of expectations to live up to on the Wii U. Marketed to be a cute, yet beautiful title to usher in the new HD visuals of the system, it was understandable that many were looking forward to its release. I was, however, legitimately concerned that Nintendo was producing an average RTS (compared to its predecessors) that wouldn’t have helped the system sell, especially when the Wii U desperately needs support. Luckily for us Nintendo fans out there, Pikmin 3 delivers well in practically every aspect of it, including its highly addictive co-op modes, and instantly made the Wii U library a much stronger one. 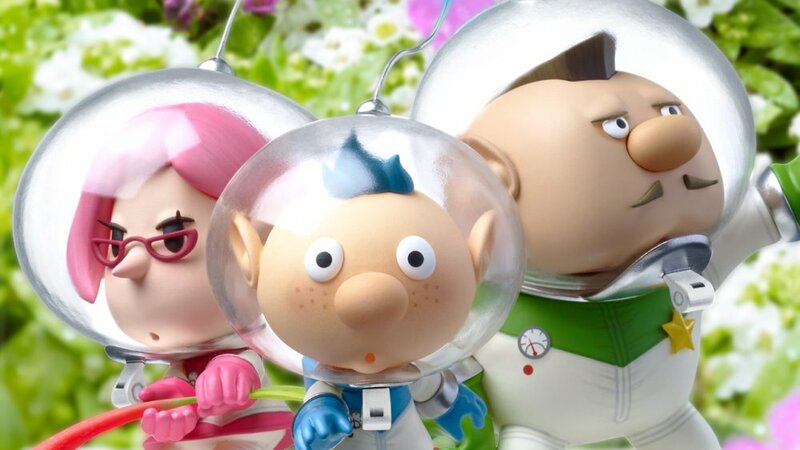 The premise of Pikmin 3 revolves around three different “Captains” (in quotes because there’s only one actual captain of the three): Charlie, Alph, and Brittany, in their search for fruits on the mysterious planet they crash land onto. Initially they‘re separated from one another and have to work with the Pikmin to reunite. It then becomes apparent that the three are stranded from their alien home world of Koppai until they can find a certain part for their broken spacecraft. It is here that fans of the series are told that a familiar face found their part first, requiring the player to survive each day until they cross paths with him. For starters, this game has absolutely lush environments, ranging from grassy, giant plant filled jungles, blisteringly hot deserts, or mountains packed with fluffy snow. But the funny thing to know about them is that, since the Captains are only a few centimeters tall compared to the average human, an old coffee can will look like a two-story building to the player. Essentially, you’re playing in a world like the film: Honey, I Shrunk the Kids. Filled with crazy hybrid, alien monsters to engage in battle and, of course, the various Pikmin themselves that the series is well known for, the Wii U’s HD capabilities take any and all visuals to a whole new level; it was like the series was meant to be played in HD. Working much like a colony of ants, players are tasked to complete any number of tasks in a day before night time arrives, when all the large enemies come out to feed. This instantly makes gameplay all about working against the clock, all while figuring out how to navigate around environmental roadblocks to access vital resources of colorful fruit and spaceship parts. While I was worried that I wouldn’t be able to relax and take in all that Pikmin 3 had to offer, I was relieved to see the developers kept this in mind and made room for both the atmosphere experience and the urgency of daily events, without me hardly realizing it. The game does require the player to stay active and productive with his hunting and gathering, but doesn’t completely punish him for exploring despite the 15-minute per day time limit. In short: I was never in fear of failing my ultimate mission of returning to Koppai with a large stash of fruit juice in hand. 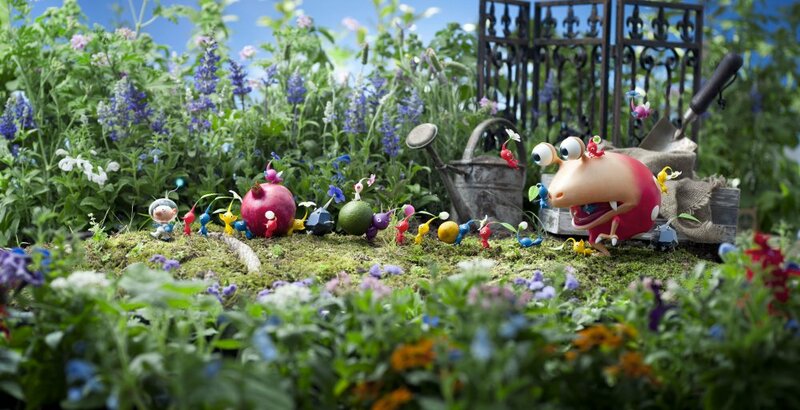 Although there are only a handful of actual co-op modes in the game, Pikmin 3’s main storyline is almost a co-op game in itself. These three can be controlled individually and spread out across the large maps, all to help in multi-tasking throughout the levels. However, when two or more Captains come together, they can coordinate and navigate around the environmental puzzles to achieve great rewards or unlock new areas to explore. For instance, the only way to for Alph to reach a certain fruit on a giant tree stump is by throwing Brittany onto it with a handful of Pikmin to assist her. Switching control over to her, I can then use her group to reach the fruit and bring it back to camp. Puzzles like these make me feel like I’m playing co-op with myself, actually. This makes me feel a bit disappointed that Nintendo didn’t allow for multiple players to assist in the main storyline, but this is by no means a deal-breaker for the game. 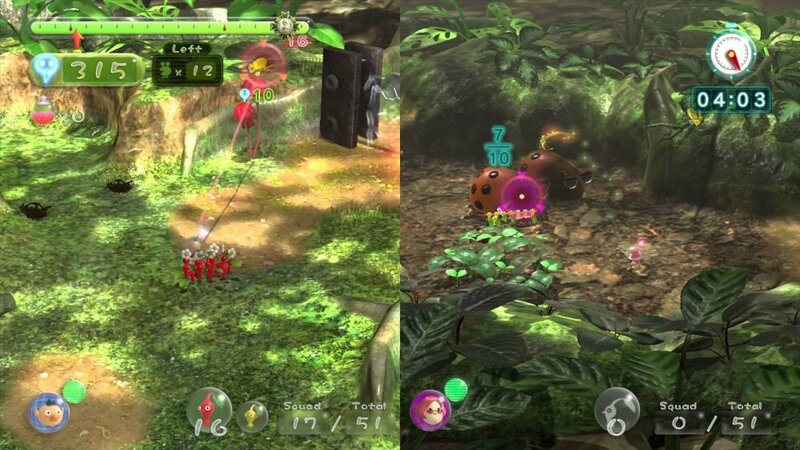 The true co-op mode of Pikmin 3, found through the “Mission” feature on the title screen, contains three game types that can be played with one other player via local, split-screen co-op: “Collect Treasure!,” “Battle Enemies!,” and “Defeat Bosses!.” Each game variant has the players working together to complete the main object, whether that be going around retrieving as many fruits as possible, defeating and collecting as many monsters as possible, or combining Pikmin forces to defeat a gigantic boss fought previously in story mode. These modes all have a specific time limit, where its duration depends on the level I select. While it was possible to complete the first stages in any particular mode on my own, I soon realized that I would need an additional player to reach the later stages, mainly due to the difficulty and size of the stages. I soon found a co-op partner to divvy up the tasks laid out on each particular stage. For example: she chose to be in charge of carrying the fruits and dead enemies back to base, while also creating and managing our Pikmin army for both our use. I was in charge of killing as many enemies as possible to work my way through the stage’s various puzzles. Together, we worked on our high score and unlocked more challenge levels to complete. It’s interesting to note that even though Pikmin 3 is limited to two player co-op, though some levels have all three Captains present. This provides a new way of sharing control of said third Captain to complete puzzles. Page created in 0.3136 seconds.